Posted July 19, 2017 by admin & filed under Featured Inner West Independent, Inner West Independent. Almost three years after they were initially promised by the state government, the cyclists of Sydney’s inner west are still awaiting the installation of secure bike sheds at Redfern station. The sheds were slated for installation almost two years ago, but were backtracked by Transport NSW despite being rolled out at other stations across the state. 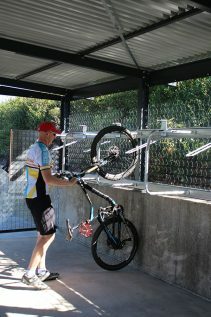 The bike sheds are an initiative of the Transport for NSW Bike and Ride program, which is designed to encourage locals to use the more sustainable transport alternative. The plans, which were unveiled in early 2015, are set to provide 50 dedicated bike spaces to offer cyclists a secure way to store their bikes at one of Sydney’s main transport hubs. But two years later, as Caringbah and Gosford stations welcome their bike sheds, one of Sydney’s busiest transport hubs is left behind. Member for Newtown, Jenny Leong, said that the government needs to prioritise investing in sustainable public infrastructure over private developments. According to Bicycle NSW, the sheds are being incorporated into the heritage works in the area, and won’t be installed until March 2018. A spokesperson at Transport for NSW said the previous date of installation was stretched out due to additional design considerations. “Transport for NSW is working collaboratively with other government agencies to ensure the proposed bicycle storage facilities take into consideration the sensitive heritage aspects surrounding Redfern Station, as well as meeting the needs of cyclists. Detailed design is currently being undertaken,” they said. Although Redfern was listed as one of the first nine locations to receive the sheds due to demand and patronage, the sheds at Caringbah were delivered much earlier, with the Council opening the Opal-activated shed to the public last month. But some members of the community feel they were kept in the dark about the new installation date, with no public updates about the revised plan. Ms Bell said the cycling infrastructure is crucial to help Redfern station accommodate a large amount of commuter-traffic passing through the area. “We see Redfern as a vital link, with a large proportion of commuters changing at Redfern to reach their final destination. Everyday we see large numbers of bikes parked at Redfern station and can only assume the addition of secure bike storage would do a lot to encourage more people to consider using a bike as part of their commute to help reduce their total train travel, and potentially could reduce the high volume of commuters changing trains there every day,” she said. But according to Ms Bell, the cycling community should look forward to a number of other developments, with the state government currently rolling out a number of projects that are welcome for the community. “We currently liaise with the NSW State Government on a number of projects with bicycle infrastructure being the predominant focus… Recently, Minister Constance announced a $62m budget for walking and cycling projects to be funded in the 2017/18 budget year…We also have continued to liaise on WestConnex with a view to ensuring cycling infrastructure is included in the development,” she said. With more people choosing to cycle in denser, urban areas in NSW, the roll-out of infrastructure that supports cyclists is crucial. According to Ms Leong, the state government need to shift their development priorities and focus on delivering public infrastructure. “We need to be seeing the government prioritising investment in sustainable public transport solutions in our city… They’re privatising land just to one area, but at the same time, they can’t get the basic public infrastructure right. It’s reasonable that the community starts to question what their motives are and what their priorities are,” she said.